Elio Villafranca. Courtesy the artist. african., carnegie hall., cuban., Dizzy's Club Coca Cola, jazz at lincoln center., jazz., live music. Cuban jazz pianist and composer Elio Villafranca is a figurative painter of stories of freedom in a palette of classical, latin and jazz colors. Elio teaches at Manhattan School of Music and Juilliard, but is a student of history. His compositions ride the passages of the African diaspora that connect us all through Cuba. I don’t know how to explain it, but whenever I’m with Elio, I feel a very strong presence. He is more than a jazz musician. There is something mystical about him, like a very old soul, like a great tree. You just have to see Elio live and if you have the chance, talk to him. It’s something you will remember. His hero image is a great picture. In a way it represents the African diaspora through which African spirit travels everywhere. December 7, 2018 ~ Elio Villafranca’s ‘Cinque’ is nominated for a Grammy (that’s Grammy, not Latin Grammy) for “Best Latin Jazz Album.” Congratulations Elio. You’ve come a long way from Pinar del Rio, Cuba. Joseph Cinqué (Sengbe Pieh, c. 1814 – c. 1879) was a historical figure. He was a West African man of the Mende people who led a successful mutiny on the Spanish slave ship La Amistad. The ship was taken to Connecticut by the old equivalent of the U.S. Coast Guard. Cinqué was imprisoned and tried for murder. The U.S. Supreme Court ruled that he had justifiably defended himself. Americans raised money to pay for his return to Africa. He went home. New York Latin Culture Magazine joined Elio on a trip to Connecticut to visit Cinque’s memorial. You can read more about it below. All-star Latin Jazz ensemble Nuevo Jazz Latino plays The Appel Room at Jazz at Lincoln Center, Friday and Saturday, November 3 – 4, 2017. That’s pianist Elio Villafranca, saxophonist Yosvany Terry, drummer and MacArthur Award-winner Dafnis Prieto, and genius conguero-vocalist Pedrito Martinez – plus two native New Yorkers: trumpet powerhouse Mike Rodriguez and Jazz at Lincoln Center Orchestra bassist, composer, arranger, and educator Carlos Henriquez. Wow! Villafranca performs “Cuba – Senegal: Letters to Mother Africa II” at Aaron Davis Hall at the City College Center for the Arts in Harlem on Friday, March 31, 2017 at 7:30pm. Elio Villafranca. Courtesy Rebecca Meek/Elio Villafranca. Villafranca presents “Letters to Mother Africa” in the Appel Room at Jazz at Lincoln Center’s on Friday and Saturday, October 14-15, 2016. Elio is from a small town near Pinar del Río, the capital of Pinar del Río Province, the westernmost province of Cuba. It is tobacco country, famous for Cohiba cigars, the premium Cuban cigars that used to be reserved for Cuban government officials (not the Dominican “Cohibas” sold in the U.S.). Pinar del Río has always been a rural backwater, so the old culture remains. Though today’s dominant Afro-Cuban culture is Yoruban from West Africa, the largest numbers (almost 40%) of enslaved Africans were Bantu peoples from the Congo region of Central Africa. Pinar del Río is a place where this Congolese culture still exists. Elio grew up poor, but found his way to the Instituto Superior de Arte in Havana, Cuba where he received a classical training in percussion and composition. Cuba has a strong, but very competitive arts education system. It’s not enough to be good. You have to prove you are good every year. When Elio discovered Jazz, he recognized the folk music of his hometown. I think that Elio heard Jazz and thought, “That is us,” and the Jazz world heard Elio and thought, “That is us.” How about that? Returning to explore the music of his childhood, the old men in his town teased Elio because as a boy he never cared much about it. In Cuba, Elio toured the world for eight years in the band of Nueva Trova singer-songwriter Carlos Varela. Elio came to the States to pursue his love for Jazz in 1995. He is known for his expertise in the many rhythms of the African diaspora. After seven albums as a leader and several Grammy nominations, Elio has become a world-class Jazz musician. Elio Villafranca brings his “Cinque – Suite of the Caribbean” back to Dizzy’s Club Coca-Cola at Jazz at Lincoln Center on Saturday and Sunday, April 16-17, 2016. Shows at 7:30 & 9:30pm. Saturday $45, Sunday $35, Student $30 (9:30pm only). Cuban Jazz pianist and composer Elio Villafranca is a figurative painter of musical stories with a palette of Jazz, Latin, and Classical colors. He flows naturally between musical languages without ever getting lost in abstraction. Villafranca’s music is very cinematic. One moment Elio will take you to New Orleans, then to Havana, and then New York City. Yet each moment recalls Africa in the way that we call our ancestors when we are completely still in our heart of hearts. Elio’s compositions float the senses in the way that Jazz and Latin music are supposed to lift the spirit. At the same time, the music is always grounded. That groundedness is an essentially African quality. There is something mystical about the man and his music. Whenever we hear Elio play live, we learn something about our common history and humanity. We learn things he doesn’t even say out loud. Maybe it’s because Elio is a music professor at Temple University and teaches at The Juilliard School. Maybe it’s because many of Elio’s recent compositions are inspired by the African diaspora’s struggles for freedom in the Americas. Elio Villafranca, like just a few great men and women throughout history, has freed himself. That must be why his music and thoughts resonate so strongly in those who will listen. In that recording, Elio explored the Congolese traditions shared across the Caribbean and by the African diaspora throughout the Americas. This led Elio to study the many historic attempts to win freedom that occurred wherever slavery existed. One of the most interesting of these was the Amistad rebellion which largely played out just north of New York City in New Haven, Connecticut. La Amistad was a Spanish slave ship that was taken over by its cargo of Africans and brought to New Haven by the U.S. Coast Guard in 1839. How ironic that “Amistad” means “Friendship” in Spanish. 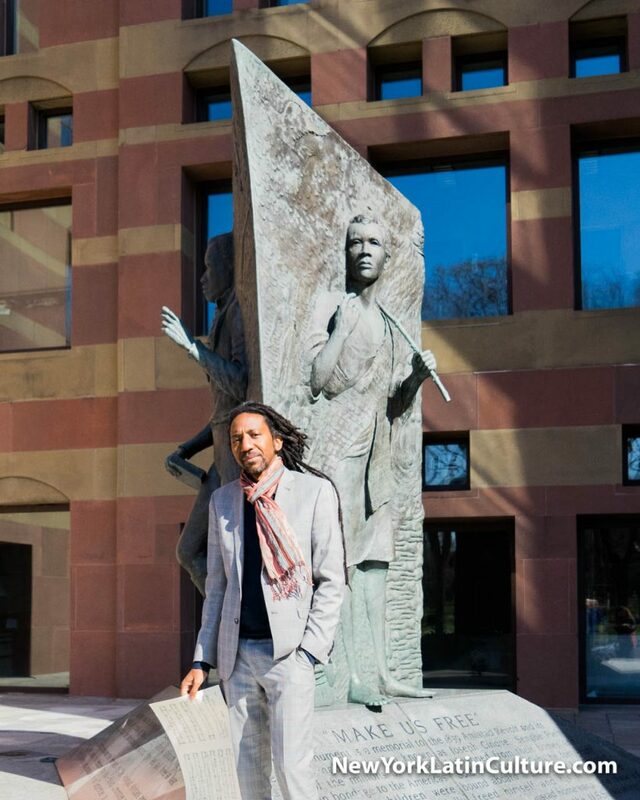 Elio Villafranca with the statue of Cinqué at the Amistad Memorial in New Haven, CT.The Africans actually won their freedom by winning a trial in a Connecticut State Court and an appeal to the U.S. Supreme Court defended by former U.S. President John Quincy Adams. It was a notorious national and international incident of the time. The leader of the Africans was a West African man (Sengbe Pieh) known as Joseph Cinqué. In 1977 Steven Spielberg made a film “Amistad” about this great story. In the film, the treatment of the Africans, a walk through the ship’s hold, and the inhumane rationales of slaveholders are all equally disturbing. A few things stand out from this story. Though Cinqué didn’t speak English or Spanish, a translator was found for his Mende language. Though Cinqué gained instant celebrity in the trial, he told his lawyer that he was just a regular man. That opens possibilities for each of us to connect with the great person inside. A reporter who met Cinqué during the trial described him as “uncommon decision and coolness, with a composure characteristic of true courage.” If you want to be free, you have to stand up for your rights, but you also have to keep your cool. During the trial, Cinqué did say a few words in English. He said, “Make us Free.” Those words are inscribed on the Amistad memorial on the former site of the jail in New Haven. In the trial before a U.S. Supreme Court dominated by men who were slaveholders themselves, John Quincy Adams appealed to the wisdom of our ancestors, referring to George Washington, Thomas Jefferson, Benjamin Franklin and so on. That was a clever argument, especially because calling the ancestors is an essential part of African ritual and celebration. I think you’ll find all of these elements in Elio Villafranca’s meditation on a great man of history who fought for his freedom and kept his cool to truly earn it. It’s an example for us all, regardless of our heritage, and especially in this moment of our history when emotion easily clouds reason. Elio will be joined in the April 2016 performances of “Cinqué ~ Suite of the Caribbean” by alto saxophonist/flutist Vincent Herring, tenor saxophonist/clarinetist Greg Tardy, bass clarinetist Todd Marcus, trumpeter Freddie Hendrix, trombonist James Burton, acoustic bassist Gregg August, drummer Jaimeo Brown, percussionists Arturo Stable and Jonathan Troncoso, and Xiomara Rodriguez who is one of New York City’s leading Afro-Cuban dancers.